Our wedding party is large and a bit different. With seven boys standing up with Mr. Narwhal, and two boys and five ladies standing up with me, there was a lot to figure out. With the ladies in mind, Mr. Narwhal and I discussed what he wanted for himself and the boys. I wanted things to mesh well together, but again, didn't want to go for the matchy matchy. Mr. Narwhal was set on a slate blue vibe of sorts and the two of us spent a lot of time Googling, Pinteresting and discussing options. We're still on the quest to find the perfect pant. We're on the fence between a dress pant and a chino. 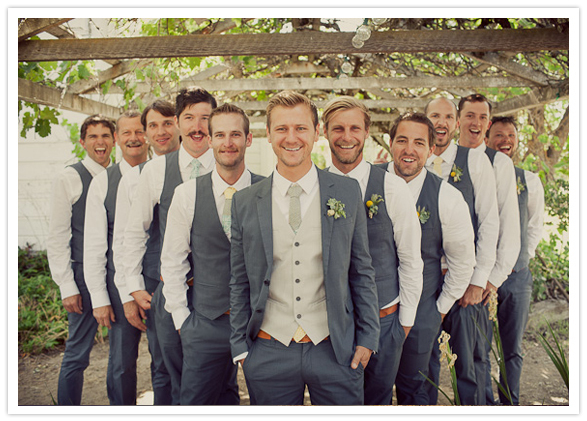 We loved the sharp look of this California wedding party and the perfection of the slate blue. Figuring out how to pull this look off and finding the perfect pant is a matter of a trip to the city. I have full confidence in Mr. Narwhal, the boy has some serious style and a keen eye for men's fashion. We just need to make the time to hit the stores! Now, this leads to my boys. I want it to be known that they're standing up with me, so dressing them the same as the groomsmen didn't make sense. After seeing a picture on Pinterest (that I cannot find!) with two boys standing up on the brides side I decided that the bridesmen will wear the same taupe colour pant as the ladies dresses. 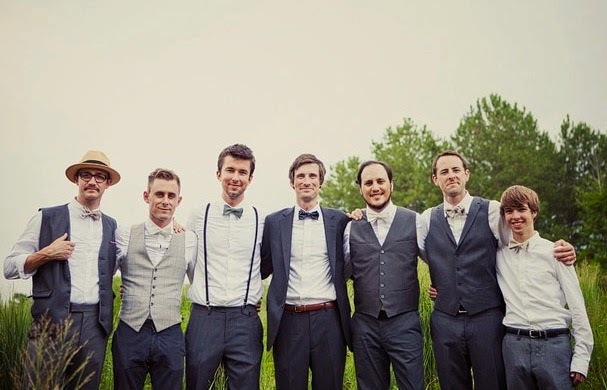 Once we figure out the groomsmen pant style, my boys will go for a similar style in taupe. Figuring out what everyone will wear has been a fun, yet tedious task. There are still details to figure out, but I have faith in our wedding party to pull it off! How did you decide on what the boys would wear?